When a mistake does occur, it will lead to a situation that wasn't at all expected that is, it is incorrect and this is known as an error. 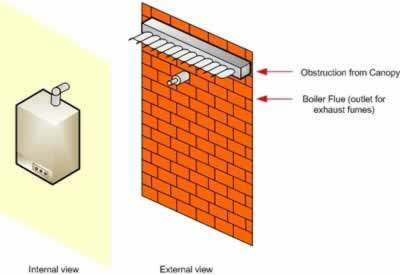 For example, a new central heating system is installed but the outlet for the waste gases (flue) from the boiler is slightly obscured by a supporting beam from a canopy, as shown in Figure 4 'Incorrect boiler installation' on the next page. Whilst the installation of the central heating system is correct, the engineer hasn't left enough room from the flue to the supporting beam. This is an ERROR on the part of the engineer. The whole central heating is switched off, to prevent further flooding. 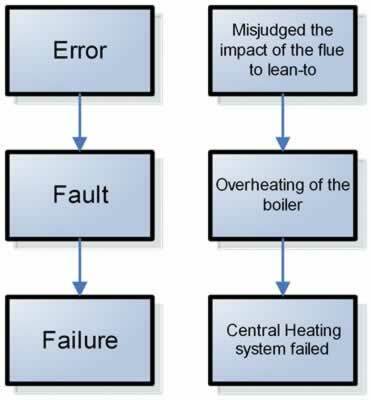 This is known as the FAILURE of the system, as it has to be switched off and can no longer provide heat around the house, as show in Figure 5 'Error, faults and failures' below. So why did this error occur? Maybe the engineer was not competent enough to realise that a certain amount of clearance was required for the flue, so that hot waste gases could be released. Maybe the engineer was in a rush to complete the job, as they also had other jobs to do that day. Or maybe the boiler was not appropriate and the seals in the boiler were already faulty. Whatever the reason for the error that caused the fault and ultimately the failure, the error could have been avoided simply by adopting a series of tests. The engineer could have assessed the level of gas emissions which could have given an indication as to whether the system was running as expected. The emissions data could have been compared to what would have been expected for such an installation, with any deviation from the expected emission levels pointing to an increased possibility of a failure of the central heating system when it was switched on. A simple emissions test as such could have saved on a whole host of problems that were caused by the boiler system overheating. In conclusion the engineer, in this example, overlooked the importance of testing and as a consequence caused the system to fail.  Testing is used to check if the requirements have been met.  Testing can be used to check the quality of a product.  Errors are a result of mistakes.  Faults are caused by errors.  Failure is caused by faults.